This is my newest inspirational hero, Mini-Darth! He was given to me for Christmas by Kim Beech. I have a Yoda inflatable lawn fellow at home & always wanted a mighty Darth Vader to go with him. A Sith Lord that would rule over the neighbourhood, reminding everyone of his inner epic-ness! And so I received this present with great joy! I was full of excitement at the opportunity of inflating him to his full darkness! And so I took him with us up to the ski chalet & plugged him in! I expected a giant Sith Lord of over 8 feet, with a commanding, overpowering & strong presence, making a bold statement of his state of being to all who might go wander by. In shock, I ended up with Mini-Darth. The little guy is barely 3 feet high! He seems to have a smile. A bewildered look, maybe. Check his sideways glance at me. I think he is kind of wondering how he ended up with such shortened potential! Never mind – he is epic in all his glory! In some ways, I think he is even better than a full Darth. All who see him are at one with his cuteness, sharing in the glory of his grin! He offers a lesson to us all – you might be tiny, but you can be mighty! 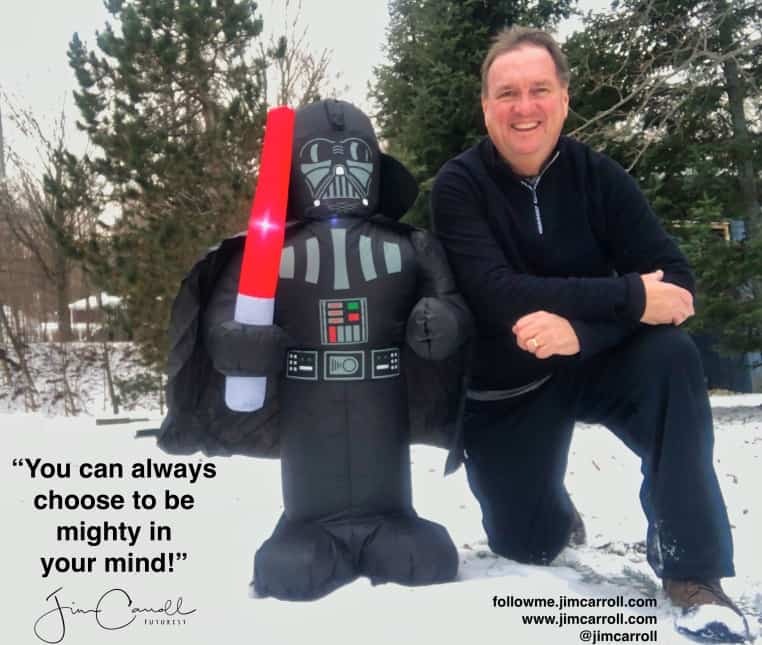 And so think of what we can learn from Mini-Darth as we go from 2018 into 2019: – you might not measure up always to the expectations that people have of you, but you can make up for it with your simple presence. – you might sense some initial disappointment when people meet you for the first time, but if you stick to your inner goodness, you’ll win them over. – you might sense that you could have been something more, but in a way, if you decide that you are, you will be! There is always some mightiness inside of you, eager to get out! And you might even have powers that you were not aware of! Hunter, the wonderful golden retriever down the street belonging to my good friends, the Gyles family, is terrified of Mini-Darth! She barks, howls, & runs away! She is worried about this new, mysterious, forbidding character who now commands the end of the street with his presence. May the Mini-Darth lesson be with you!